The cell cycle is the process a cell will go through to replicate all of its material and divide itself from one cell into two identical cells. While this is commonly known as Mitosis, in fact Mitosis is just one stage of the cell cycle. In this article, we will look at the different stages of the cell cycle and what happens in each stage. We will also consider the regulation of the cell cycle, and look at some examples of when this goes wrong. The Cell Cycle is a 4-stage process consisting of Gap 1 (G1), Synthesis, Gap 2 (G2) and Mitosis. An active eukaryotic cell will undergo these steps as it grows and divides. 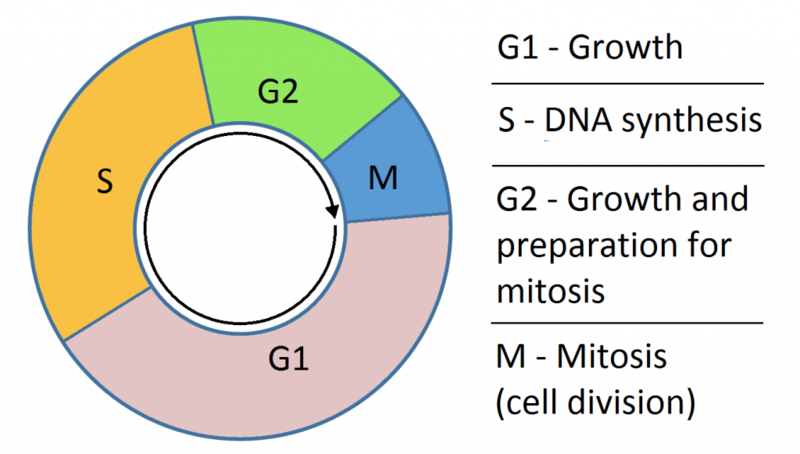 After completing the cycle, the cell either starts the process again from G1 or exits the cycle through G0. From G0, the cell can undergo terminal differentiation. Fig 1.0 – Diagram showing the stages of the cell cycle. Cytokinesis is the process of the parent cell becoming 2 daughter cells. These daughter cells contain identical genetic information. Cytokinesis also involves a division of the cytoplasm. It is considered a separate step to mitosis. The stages in the cell cycle between one mitosis and the next, which includes G1, S and G2, is known as interphase. Further details on the process of mitosis can be found here. The progression of cells through the cell cycle is controlled by checkpoints at different stages. These detect if a cell contains damaged DNA and ensure those cells do not replicate. The Restriction point (R) is located at G1 and is a key checkpoint. The vast majority of cells that pass through the R point will end up completing the entire cell cycle. Other checkpoints are located at the transitions between G1 and S, and G2 and M.
If damaged DNA is detected at any checkpoint, activation of the checkpoint results in increased protein p53 production. p53 is a tumour suppressor gene that stops the progression of the cell cycle and starts repair mechanisms for the damaged DNA. If this DNA cannot be repaired, then it ensures the cell undergoes apoptosis and can no longer replicate. This cell cycle is also closely regulated by cyclins which control cell progression by activating cyclin-dependent kinase (CDK) enzymes. An example of a tumour suppressor protein would be retinoblastoma protein (Rb). Rb restricts the ability of a cell to progress from G1 to S phase in the cell cycle. CDK phosphorylates Rb to pRb, making it unable to restrict cell proliferation. This allows cells to divide normally in the cell cycle. 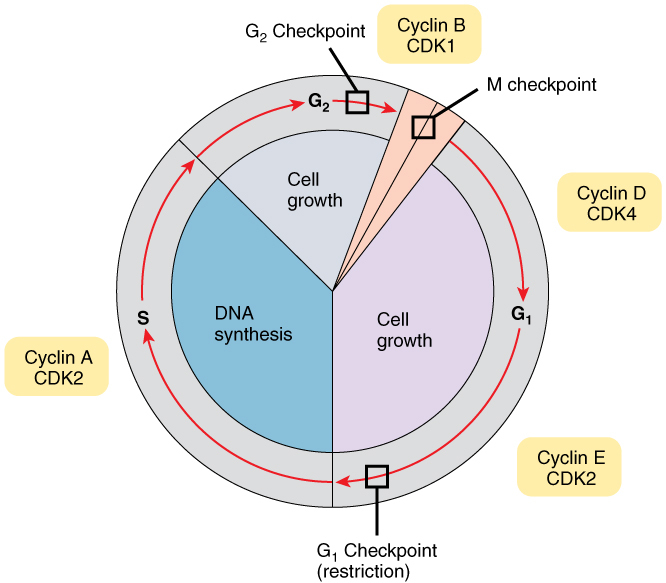 Fig 2.0 – Diagram showing the cell cycle, with important checkpoints and regulators. Neoplasia is a disease of unchecked cell division and its progression is attributed to a change in activity of cell cycle regulators. If a mutation occurs in a protein that regulates the cell cycle, e.g. p53, it can lead to cancerous cells and the rapid multiplication of these cells. When there is a defect in p53 tumour suppressor gene, it cannot detect and bind to cells with damaged DNA to either repair the damage or cause apoptosis. This leads to unchecked replication of cells in the cell cycle and increased number of mutated p53. This increases the risk of neoplasms and also brings out the cancerous properties in the mutant p53. During which phase does DNA replication occur? During which phase does mitosis occur? During which phase does the cell increase in size? During which phase does the spindle fibres attach to chromosomes? During which phase does the nuclear membrane break down? During which phase do centromeres divide? During which phase does the nuclear membrane reform? Which checkpoint, if passed, usually results in cells progressing through the entire cell cycle?